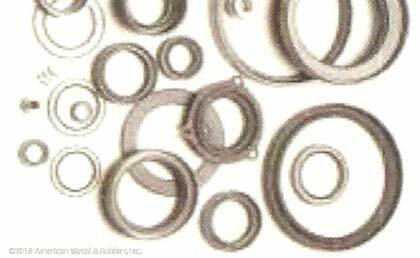 American Metal and Rubber is a supplier of O-Rings, O-Ring Cord Stock, O-Ring Assortment & Splice Kits, Spliced and Hot-Vulcanized O-Rings, Oil Seals, Hydraulic and Pneumatic Seals, and other sealing products. Application: Commercial and Military grade. Viton®: Fluorocarbon (Viton®) exhibits exceptional resistance to chemicals, oils, temperature extremes (-13°F to +446°F), low compression set, low gas permeability and excellent aging characteristics. Applications include: aircraft engines, automotive fuel handling systems, and chemical processing industries. FKM is also suitable for high vacuum applications. It is not recommended for exposure to ketones, alkalis, and Skydrol® fluids. Custom compounds are available with improved chemical and low temperature resistance. Nitrile / NBR: Nitrile (Buna-N) is the most widely used elastomer due to its excellent resistance to petroleum products, operating temperature range (-40°F to +257°F) and one of the best performance-to-cost values. It's an ideal material for aerospace, automotive, propane and natural gas applications. Special Hydrogenated Nitrile (HNBR) compounds can improve resistance to direct ozone, sunlight, and weather exposure while increasing temperature range to +300°F. Ethylene-Propylene / EPDM: EPDM has outstanding resistance to heat, water and steam, alkali, mild acidic and oxygenated solvents, ozone, and sunlight (-40ºF to +275ºF); but it is not recommended for gasoline, petroleum oil and grease, and hydrocarbon environments. 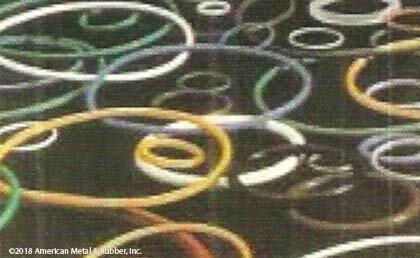 This popular rubber compound is usually the first choice for low torque drive belt applications. Fluorosilicone: Fluorosilicone (-75º to +400ºF) combines the good high and low temperature stability of silicones with the fuel, oil, and solvent resistance of fluorocarbons. FVMQ is unparalleled for aerospace fuel systems, auto fuel emission control systems and to meet or exceed government, military, aerospace, automotive, industrial and commercial specifications. However, due to relatively low tear strength, high friction and limited abrasion resistance of these materials, they are generally not used in dynamic applications. They are also not recommended for exposure to brake fluids, hydrazine, or ketones. Silicone: In the Silicone family, you will find compounds which are superior as static seals in extreme temperature conditions. Standard compounds handle operating temperatures -85º to +400ºF. Silicone compounds are popular in food and medical applications because they are very clean and do not impart odor or taste. Special Phenyl silicones can be used down to -148°F. Neoprene®: Neoprene (-40º to +250ºF) is reasonably priced and features good resistance to petroleum oils, ozone, sunlight and oxygen aging, relatively low compression set, good resilience and outstanding physical toughness. It is the preferred sealing material for the refrigeration industry because of its resistance to ammonia and Freon®.